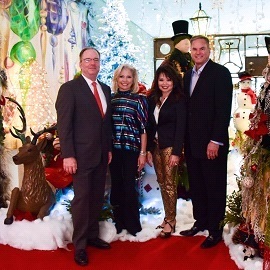 Deck the Trees Co-Chairs, Pepette and Joe Mongrain, along with Jeanie and Don Sweet led the way to bring in over $250,000 in support of artistic and educational enhancements for the Alley Theatre in conjunction with the 12th Annual Deck the Trees event. Over 30 of Houston’s leading designers created traditional, whimsical, and character-inspired trees and wreaths in which sponsorships were available from $2,500 to $50,000. Neiman Marcus, Macy’s, Richard Flowers and the Events Company, For All Occasions, Saks Fifth Avenue, Bering’s, Donna’s Home Furnishings, and Eklektik Interiors were among the many decorators who participated. Premier tree designer Scott Michael Designs transformed the Alley’s 25’ signature tree Dicken’s style complementing the holiday production of A Christmas Carol - A Ghost Story of Christmas. Trees can be viewed at the Alley through January 3 with the admission of A Christmas Carol ticket. For ticket information please contact the Alley box office at 713.220.5700.